The house fire started shortly before 11 p.m. Wednesday on Rich Court by Augusta Street near the Terrace Hill Open Space. The fire burned through the roof of the house and filled rooms inside with smoke. A neighbor who witnessed the fire said a woman ran out of the burning home yelling that her husband was still inside. The couple’s dog made it out of the burning home, the neighbor said. The neighbor heard explosions coming from the garage of the home, and it sound like the residents’ cars were exploding. He rushed to bring his kids to safety because the fire was so hot, and he noticed that the headlights on his car had melted. Officials have not disclosed the identity of the man who died in the fire. It is unclear what caused the blaze. 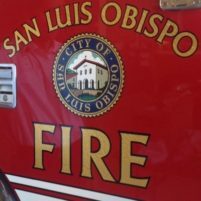 Early Wednesday morning, multiple train cars caught fire while on the tracks near Orcutt Road and Laurel Lane. The train cars were full of used railroad ties, which may have caused hazardous chemicals to be released into the air. Fire officials said Wednesday morning they were not ruling our arson as the cause of the rail car blaze.